Our Lady of the Rosary is a title given to the Blessed Virgin Mary. 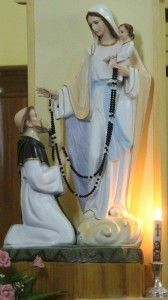 The origin of the Holy Rosary is often associated with St Dominic following a vision from Mary, encouraging him to recite and spread its use and message throughout the world. The Feast of Our Lady of the Rosary is also known as Our Lady of Victory, following a Christian naval battle in 1571 when an Ottoman fleet’s attempted invasion of Western Europe was defeated and because of it, Christianity remained; all attributed to the intercession of the Blessed Virgin Mary. Our Lady of the Rosary and Our Lady of Victory is the Patron Saint of many Churches and societies worldwide. The Feast of Our Lady of the Rosary is the 7th October. O Most Pure Heart of Mary, full of goodness, show your love towards us. Let the flame of your heart, O Mary, descend on all people.